Brain malformations causing various neurological deficits are being recognized as a significant public health concern and are the subject of growing etio-pathological interest. In isolation or associated with extracerebral anomalies, they belong to the vast spectrum of embryofetal disorders (birth defects), which are nowadays a prevalent cause of neonatal and pediatric mortality and morbidity in developed countries. However, most remain unexplained and treatments or preventive measures are scarce. Usually, brain malformations, resulting from chromosomal/genetic mutations or disruption, are only documented from a clinical and a radiological point of view and named by morphological descriptive terms. To further refine the characterization of brain malformations, neurohistopathological studies have emerged as a powerful tool. 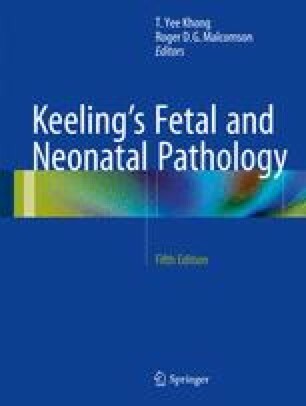 Embryofetal and neuropathological studies performed after fetal death or termination of pregnancy have demonstrated a positive impact of such necropsy-based studies on the identification of the pathogenesis of brain malformations, in addition to illustrating their phenotypic diversity and revealing genetic heterogeneity (i.e., genocopies). Indeed, the new-generation DNA sequencing techniques permit identification of a growing number of genetic variations. Interestingly, functional studies reveal involvement of these genes in distinct biological processes and molecular pathways. Dissection of molecular cascades of signaling pathways using genotype/phenotype correlations demonstrates that mutations in different genes involved in a common signaling pathway may result in overlapping patterns of malformation. Furthermore, signaling pathways may be a possible target of exogenous agents, which will phenocopy genetic causes. Thus, signaling pathways have emerged as key modulators of phenotypic diversity. Integration of these important findings opens a new way in the evaluation of malformations, based on functional disorders, such as ciliopathies, tubulinopathies, dystroglycanopathies, mTOR pathway disorders, etc. This new approach ends the classical dogma of one gene/one disease and improves our understanding of the genetic and phenotypic heterogeneity of birth defects.